The combination web development and accessibility is my passion. For a wide range of clients I train the people involved in a web project. Before and during the build of a web project I review, consult and research, to make the project as accessible as it can be for all visitors and users. At the moment I work as an accessibility consultant for the full service digital agency Level Level. I work on client projects and train my colleagues. For Humanmade.com I worked on client projects and helped with the rebuild of the company website. At the moment Human Made is hiring me through Level Level for consultancy. For the Genesis Framework I did an accessibility overhaul to make it WCAG 2.0 AA compliant. Tenon.io mentioned Genesis as the most accessible WordPress framework in their research in 2018. In 2018 we started the Level Level Academy. Here I give a series of workshops about good practice for designers, developers and content creators. I give in-house workshops for companies like Team Yoast, Yard Internet, Stuurlui, Human Made and Geev vorm. Oogvereniging.nl (Dutch site): WordPress theme for the Dutch Eye Association. This website is approved WCAG 2.0 AA accessible by the Dutch Accessibility Foundation. Game-accessibility.com: WordPress theme for this portal for gamers and developers about the accessibility of digitale serious games, commissioned by the Dutch Accessibility Foundation. Since 2012 I contribute to the WordPress project. I give presentations and workshops at WordCamps and meetups. If you want to meet me or invite me to speak, please contact me. Together with Monique Dubbelman I organise the WPMeetup in Leiden. 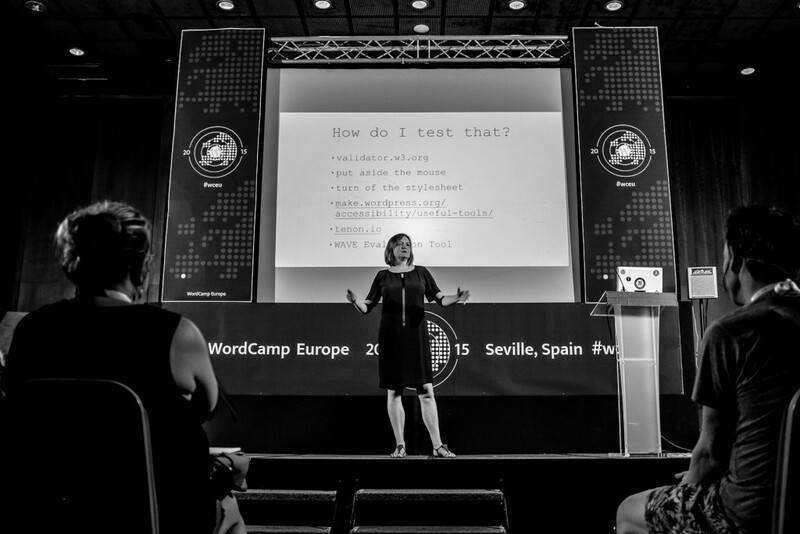 Once every 3 months we invite two speakers to share their knowledge of WordPress and the web. Until end 2018 I was an active part of the WordPress Accessibility Team. For this I got props for several WordPress releases and “rockstar” credits for 4.3 & 4.5. In 2016 Knowbility gave me the Heroes of Accessibility Award for Individual Achievement for my contributions to WordPress.